The weather this week has been stunning, with unusually high temperatures for this time of year. 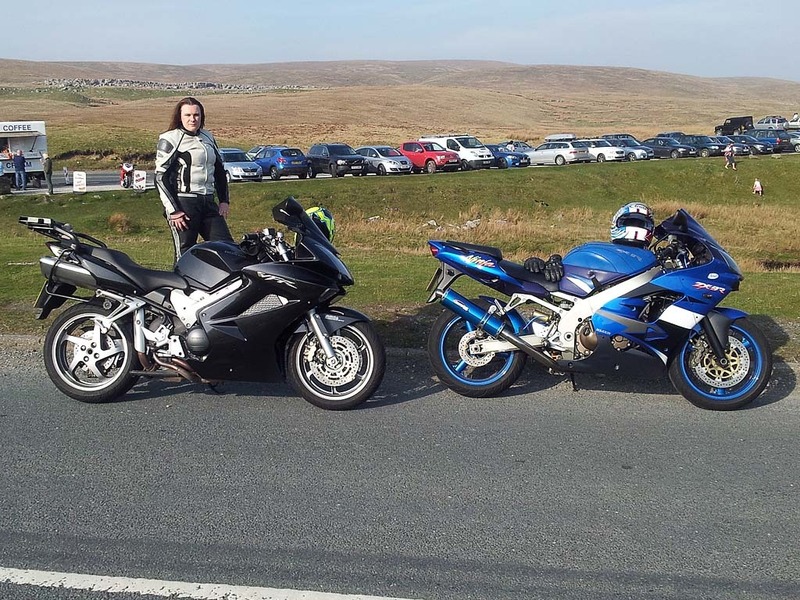 We decided that it was easily warm enough for the first outing of our leathers in 2012. We decided to have a fairly short run around the Dales and so headed over to Clitheroe by our usual roads. From Clitheroe we followed our usual route to Settle via the minor backs roads of Sawley and Wigglesworth. We stopped in Settle for lunch at the Ye Old Naked Man Café. We left Settle and joined the B6479 and passed through Horton in Ribblesdale before turning right at Ribblehead Viaduct. We then followed the stunning B6255 to Hawes. The dodgy resurfacing that was carried out last year has completely bedded in now and so I have complete faith in this stretch of road again. Just as we arrived at Hawes we noticed that a new 40mph zone had been added just before you get to the 30mph zone. It is quite a sensible speed reduction zone and is not extended further than is required. 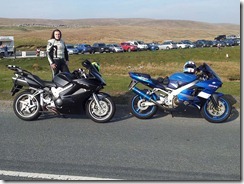 We passed through Hawes and then turned off the main road to take the road over Buttertubs Pass to Muker. Thankfully there were no sheep about trying to commit suicide this time. We passed through Muker and then followed the B6270 through Gunnerside to Reeth. This is not really a road for stiffly setup sportbikes as it is very bumpy in places. I left the ground several times on the ZX-9R so I can quite imagine how bad it could be on a sportsbike. At some point along this road we did come across an imbecile who had parked up around a blind bend in a dip on our side of the road. Anyone coming around this corner at speed, whether it be a car or bike would have been in trouble. We soon arrived in Reeth and stopped to sample one of the many lovely ice cream flavours on offer. We left Reeth on the B6270 and headed towards Grinton, where we turned onto minor roads and headed over Wipperdale Bank past the rifle range to Leyburn. In Leyburn we joined the A684 and headed back to Hawes. From Hawes we re-traced our route all the way back home, with a brief stop at Clitheroe Services for fuel.